Ready to make a splash? 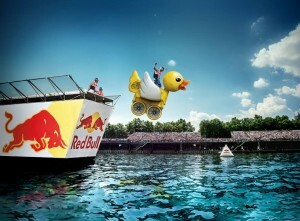 TriMet takes you to the Red Bull Flugtag! The Red Bull Flugtag will make a splash at Tom McCall Waterfront Park Saturday, August 1, starting at 11 a.m., and TriMet is your ride to the fun. Flugtag, which means “flying day” in German, is a celebration of human-powered flight where 20 local teams launch themselves off a flight deck 28 feet above the Willamette River. Will they soar into the wild blue sky or plunge into the cold blue water? Some 70,000+ spectators are expected to be on hand to find out, so parking will be in short supply. All MAX lines and more than a dozen bus lines serve the downtown Portland area and will drop you a short distance from the waterfront. TriMet’s online trip planner makes it easy to plan a trip, with information on travel and walk times, transfers and cost. Visit trimet.org or m.trimet.org for smartphones. While you’re enjoying the high-flying fun, don’t worry about keeping track of your TriMet ticket; let your phone be your fare. The TriMet Tickets mobile app is free to download and lets you buy 2 ½ hour tickets or a day pass anywhere at any time, and it is stored in your phone. Check it out at trimet.org/mobiletickets.